Found in Te Kuiti looking very shabby.....if walls could talk. How can we let our history slip away like this ? RUN-DOWN: Bruce Fuller is offering $10,000 to save this 104-year-old Te Kuiti building, but the community must raise a further $20,000 to qualify. A part of Te Kuiti's past has found a champion, reports Chris Gardner. 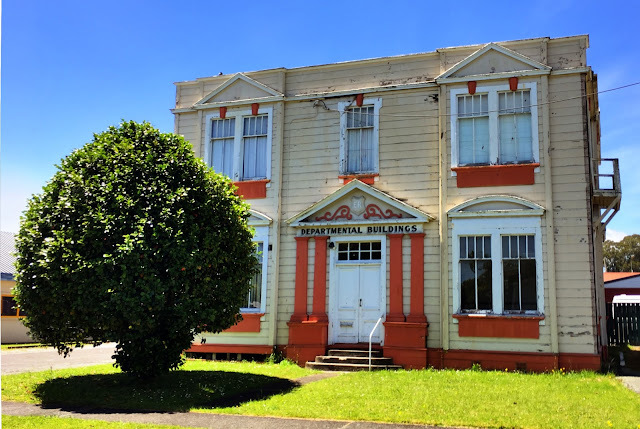 A Te Kuiti historian is offering $10,000 towards the restoration of a 104-year-old Government-built office building in the town which once featured on the cover of the AA Book of New Zealand Historic Places. To qualify for the grant, from Bruce Fuller, owner Waitomo District Council mustcontribute a further $10,000 to restore the rimu and kauri-framed building, which stands on Ministry of Justice land opposite Te Kuiti District Court in Queen St, housing a genealogical society on the top storey. It is also used as a store by Te Kuiti and District Historical Society which runs a museum at a railway cottage in Rora St.
And Mr Fulller, a member of the New Zealand Historic Places Trust who has lived in Te Kuiti seven years, also wants the community to raise a further $10,000. Mr Fuller complained in a submission to the council that the town was not interested in restoring the partially rotten, two-storey office building because it was not in Rora St.
"I believe this historic building should be saved at any reasonable cost," Mr Fuller said. "Te Kuiti is much more than just Rora St. It has treasures that are not given much emphasis." The building was used as office space by Government departments until 1987 when it was gifted to the council which has allowed community groups to use it since. Mr Fuller said it was protected by the Historic Places Trust schedule but became descheduled when the trust believed it had been demolished. The trust did not return a call from the Waikato Times. "We will hand over $5000 initially," Mr Fuller said. "The council will be required to match that and the community will be required to raise $10,000. We will then donate a further $5000." Mr Fuller said the offer would be withdrawn on December 31 if the historical society had not moved out and the the council had not taken it up by then. "The purpose of upgrading the building would be twofold. "Firstly, who wants a a crumbling mess in their community? It is common knowledge that buildings which deteriorate become the target of vandals. "Secondly, we believe that the lower area of the building has great potential," Mr Fuller said. "We have heard of a number of smaller clubs who would be interested in a small meeting place." Waitomo Mayor Brian Hanna said the council could not afford to launch a restoration bid and it would like to hand ownership of the building back to the Government. "At this stage restoration is not a high priority," Mr Hanna said. He suggested a public meeting to see what the community wanted. Jim O'Halloran, chairman of the historical society, said Mr Fuller's offer was generous but he expected restoration to cost much more. The society planned to move its artefacts out of the building sometime in the next decade once it had purpose built a store behind the Rora St museum.